The American Institute of Architects (AIA) has selected the Gateway Center at the SUNY College of Environmental Science and Forestry (ESF) as one of the nation's top 10 sustainable architecture and ecological design projects that protect and enhance the environment. The selection was announced Earth Day, April 22, by the AIA and its Committee on the Environment (COTE). The projects will be honored at the AIA 2014 National Convention and Design Exposition in Chicago. In making the announcement, the AIA called the Gateway Center "a striking symbol of environmental stewardship and climate action leadership." "This LEED Platinum campus center meets ESF's goal of reducing the overall carbon footprint of the campus through net positive renewable energy production, while creating a combined heat-and-power plant and intensive green roof that serve as hands-on teaching and research tools," the AIA stated. "The double-ended bioclimatic form exemplifies passive solar design. Net positive energy systems integrated with the design serve four adjacent ESF buildings, providing 60 percent of annual campus heating needs and 20 percent of annual power needs." The Gateway Center, which formally opened in September 2013, is both a hub for campus activity and a teaching tool that demonstrates sustainability. In addition to the unique power plant, the building features a green roof that uses native plant species from eastern Lake Ontario dunes and alvar pavement barrens at the northeastern end of Lake Ontario. The jury that reviewed this year's AIA COTE submissions called the Gateway Center "a clear expression of the College of Environmental Science and Forestry's academic mission to advance knowledge about the environment and best forestry practices." "The building takes on a difficult site for solar orientation, yet is able to bring sunlight into the interior without excessive heat gain and while creating delightful learning spaces," the jury commented. 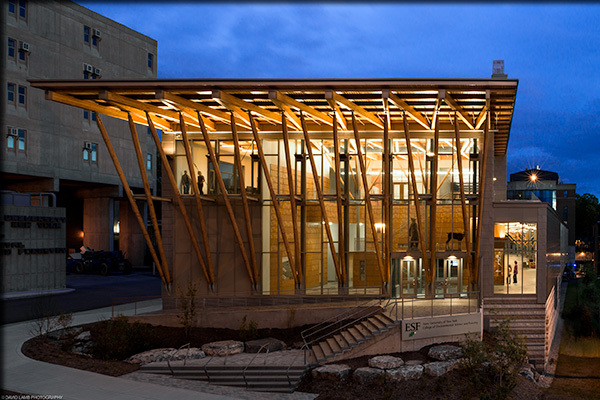 "The biofuel-fired central plant incorporated into the building is also a learning laboratory." The COTE Top Ten Awards program, now in its 18th year, is the profession's best-known recognition program for sustainable design excellence. The program celebrates projects that are the result of a thoroughly integrated approach to architecture, natural systems and technology. They make a positive contribution to their communities, improve comfort for building occupants and reduce environmental impacts through strategies such as reuse of existing structures, connection to transit systems, low-impact and regenerative site development, energy and water conservation, use of sustainable or renewable construction materials, and design that improves indoor air quality. This year's top 10 also includes buildings in Arizona; Portland, Ore.; Brooklyn; Baltimore; West Virginia; California; Minnesota and Colorado. Founded in 1857, members of the American Institute of Architects consistently work to create more valuable, healthy, secure, and sustainable buildings, neighborhoods, and communities. Through nearly 300 state and local chapters, the AIA advocates for public policies that promote economic vitality and public well-being. Members adhere to a code of ethics and conduct to ensure the highest professional standards. The AIA provides members with tools and resources to assist them in their careers and business as well as engaging civic and government leaders and the public to find solutions to pressing issues facing our communities, institutions, nation and world. The 2014 COTE Top Ten Green Projects jury includes Frederick Steiner, School of Architecture at the University of Texas at Austin; Catherine Gavin, Texas Architect; Bill Browning, Hon. AIA, Terrapin Bright Green; Thomas E. Simpson, PE, LEED' AP, US East Integral Group; and Jennifer Yoos, FAIA, LEED AP, V J A A.